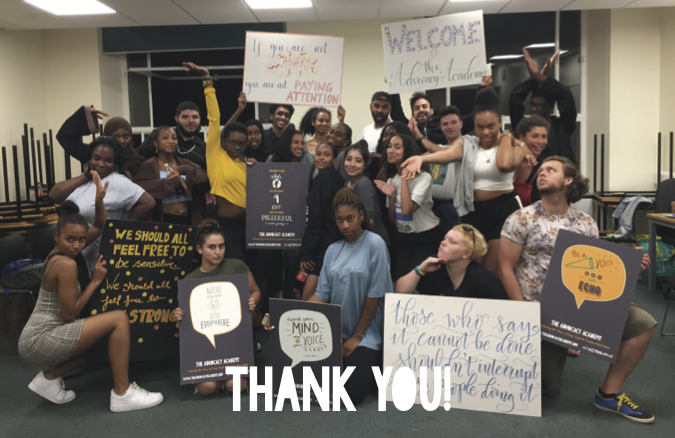 The Advocacy Academy is a South London youth movement working to unleash the power of young people to create a more fair, just and equal world. We run transformational residential programmes which give young grassroots leaders the tools they need to shape their own future and the future of their communities. This summer we will be opening the first campus for youth activists in the UK. Our new building will be a space of learning, encounter and empowerment, where young people can come together to organise for real and lasting change. We’ve managed to find the perfect space, and with your help we’ll turn it into a home. From nightly meals and community meetings to film screenings and round-the-clock youth programs, this centre will connect a new generation of young change-makers from across South London. In this new home, we will organise our community to address root causes of our problems. The result will be a resilient and tight-knit family that wins real change while nurturing each member. Policy Innovation A home for young people to help rewrite unjust rules, design better solutions to their injustices they’re facing and make our democracy truly accountable to all of us. Regardless of race, class, immigration status or gender identity, all will find safety, support, and solidarity in this second home. Young people will arrive with individual stories of alienation and oppression and find that they are not alone. ; that in collectivising our experiences and voices, we can build the power to change not just one case, but entire systems. We will build a unique and inclusive space where the expertise of the UK’s best social-change makers are combined with the passion and lived experience of young people hungry for a better tomorrow. Since our movement began in 2014, we have been looking for a space in Brixton to call our own. After four years of working from our living rooms, trawling the land registry and chasing false starts, we are more than a little excited to announce that the search is finally over. A remarkable businessman turned philanthropist has entrusted us with a property in the heart of Brixton for the next five years. To turn this space from a restaurant into a community hub still requires a lot of work: £35k of renovations to be exact. Thanks to the support of several remarkable individuals, we are already over half way to reaching that target! This leaves £15k to raise before the space is safe and can have a significant impact. We know this sounds ambitious, but if all our social media followers gave £5 each, we would blow the lid off this thing. £11,500 for a full rewire so that no one gets electrocuted on our watch - FUNDED! 8,500 for a gas safe survey and remedials so the only sparks that fly are from our Advocates - FUNDED! Your donations will help us finish the rest! Of course, the main reward is supporting the existence of a ground-breaking social justice space, built on the principle that every person has expertise and wisdom and deserves to exercise real power, creativity, and leadership in their lives. Experiences! Chances to hang out with our amazing alumni! A private tour of the Foreign & Commonwealth Office. A day long power and privilege workshop by our Changemakers. Stuff! Postcards by our Legally Black campaign team, limited edition Advocacy Academy sweatshirts, stickers, and books signed by authors like Owen Jones. Each and every supporter will receive an invitation to the Houses of Parliament to hear our Advocates deliver their speeches in September 2018 and to our Graduation Showcase in January 2019.
Who is The Advocacy Academy? The Advocacy Academy runs transformational residential programmes which unleash the power of young people to create a more fair, just and equal world. We support young leaders from marginalised communities in South London to develop the knowledge, skills and confidence to tackle some of the biggest challenges of the 21st century. Our Fellows receive intensive training in political education, community organising and movement-building. Packed with demanding workshops, speakers, discussion groups and real-life scenarios, Advocates work with top campaigners, creatives, academics and politicians to help them develop the skills to lead a grassroots campaign in their community, deliver a speech to their Member of Parliament in the House of Commons, build broad-based alliances in their neighbourhoods, and so much more. The Advocacy Academy exists to transform the culture of civic participation. We believe that real change requires power in the hands of directly impacted communities. Our contribution is to nurture young grassroots leaders with lived experience of the injustices they are fighting. We give them the tools to shape their own future and the future of their communities. Our young people lead impactful campaigns that make tangible changes in people’s lives and progress broader movements for dignity and justice. They organise on racial and gender equality, immigration, housing and environmental justice, policing, education, LGBTQ+ rights, and more. Our youth-led campaigns have already helped to increased black visibility in our media, make schools more inclusive and supportive, challenge the perception of young Muslims, and elevate the struggle of the Latin American community. Every year, we have over four applicants for every Fellowship place. We clearly need to expand in every way! - A better world is possible. There is nothing inevitable about injustice and inequality. - It is our right and our responsibility to build that world. - We strive to continually improve ourselves, our communities, and our society. - The lives of ordinary people matter. - We are one family. We love and support one another and stand in solidarity with each other. - It is our right to define ourselves, and have our identities celebrated. - We actively work to uncover, acknowledge, and overcome our biases. - We value experience, and do not do for others what they can do for themselves. Nothing about us without us! - We prize conviction, and support each other to live our values in our everyday lives. We value critical thinking and challenge. - We approach discomfort, disagreement and difficult conversations with an open and curious mind. - We practice the powerful combination of education and action. - We work to create inclusive and supportive spaces where we can each be our best selves. If you're interested in getting involved in other ways, we’d love to hear from you. Reach us at Hello@TheAdvocacyAcademy.com. An exclusive Spotify mixtape made by resident Advocacy Academy DJ Costa. Tracks submitted by Advocates from every cohort that remind them of the best time of their lives (aka the Fellowship)! One of the famous “Legally Black” posters in postcard form selected in a random lucky dip from this range: www.theadvocacyacademy.com/#legally-black! #BlackGirlMagicMakeUp: a make-up tutorial and makeover with Class of 2017 Advocate (and now Changemaker) Zhané! Plus DJ Costa’s Mixtape & a Legally Black campaign postcard. A personalised, signed copy of Darren’s spoken-word poem “Break The Label”! Plus DJ Costa’s Mixtape & a Legally Black campaign postcard. A personalised, signed copy of Class of 2018 Advocate Kofi’s spoken-word poem “I Run This Town”! Plus DJ Costa’s Mixtape & a Legally Black campaign postcard. A limited edition “Legally Black” A3 poster of your choice, signed by the campaign team! Plus DJ Costa’s Mixtape. A personalised ‘Advocacy Academy Yearbook’ - a bound copy of all our Advocates’ Parliamentary speeches from 2014-2018! Plus DJ Costa’s Mixtape & a Legally Black campaign postcard. Your own personal portrait! Class of 2018 Advocate Isaac or Class of 2017 Advocate Sarah will draw your portrait over a cup of tea! Plus DJ Costa’s Mixtape & a Legally Black campaign postcard. A limited edition Class of 2018/19 Advocacy Academy water bottle! Plus DJ Costa’s Mixtape & a Legally Black campaign postcard. A personalised video of thanks from our 2018/19 participants, including a special musical number! Plus DJ Costa’s Mixtape & a Legally Black campaign postcard. Your very own limited edition Advocacy Academy sweatshirt! Plus DJ Costa’s Mixtape & a Legally Black campaign postcard. A full set of seven postcards featuring the “Legally Black” film posers: www.theadvocacyacademy.com/#legally-black! Plus DJ Costa’s Mixtape. One hour of GCSE or A level maths tuition in London by Advocacy Academy Development Director Saba! Plus DJ Costa’s Mixtape & a Legally Black campaign postcard. An honorary position in our Movement (with a title of your choice) & an invitation to be our Guest Of Honour at one of our 2018/19 Fellowship workshops! Plus DJ Costa’s Mixtape & a Legally Black campaign postcard. Lunch & an Advocate-led walking tour of Brixton in Autumn 2018! Plus DJ Costa’s Mixtape & a Legally Black campaign postcard. A home cooked dinner with some of our Alumni & Advocacy Academy Founder Amelia! Plus DJ Costa’s Mixtape & a Legally Black poster. A bespoke half-day power and privilege workshop provided by our Founder & CEO Amelia! Plus DJ Costa’s Mixtape & a Legally Black poster.